We are a credible name that is engaged in the manufacturing and exporting of Wire Nail Making Machine. Known for its superior performance and fine finish, the range of wire nail making machines offered by us is widely praised in the market. Dedicated to the satisfaction of clients, we ensure the surpassing quality of the machines to be offered. 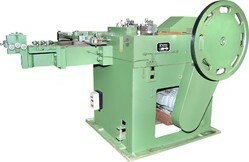 Wire Nail Making Machine have been designed and manufactured with our continuous hardships. Our wire nail making machine is made from high grade casting and steel. Three shafts design have been adopted to ensure efficient and smooth working. The main crank is directly operated by motor and side shaft by four bevel gears, which operate cutting tools. Main crank & side shaft are fitted with gunmetal bushes. Looking for Wire Nail Making Machine ?